One type of anime I enjoy watching beyond my usual slice-of-life fare is anime featuring competitive games. More commonly, people call these “sports anime,” and while I am not the massive fan of them that some others are, I certainly enjoy them, definitely far more than I enjoy watching real sports. That said, I prefer to refer to them as “competition anime,” because many such shows involving people participating in a competitive game and trying to win do not feature actual “sports.” In fact, my own personal favorite show of this type, Saki, features the much less physically-demanding and more intellectual game of Mahjong (the rummy-like table game, not the solitaire version where you match tiles to remove them). It also, perhaps more importantly to me, features lots of cute girls. Normally I would pass that off as a joke about my usual anime preferences, but since most sports anime feature predominantly male casts (and I by all means still enjoy watching them), seeing how the spirit of competition anime transcends the gender makeup of the cast is quite notable. In particular, one very popular, more recent show, Girls und Panzer, is frequently described as “Saki with tanks,” and the currently-airing Scorching Ping Pong Girls is pretty aptly “Saki with table tennis.” And while I am not watching the show, I am pretty sure Keijo is Saki with… uh, body-checking. For better or for worse, something about how Saki takes all the conventions of male-dominated sports anime and adapts them to a cast of moe girls has struck a chord and has become the standard for moe competition anime. In honor of this show’s legacy, I will take a closer look at how Saki embodies everything I love about sports and other competition anime. 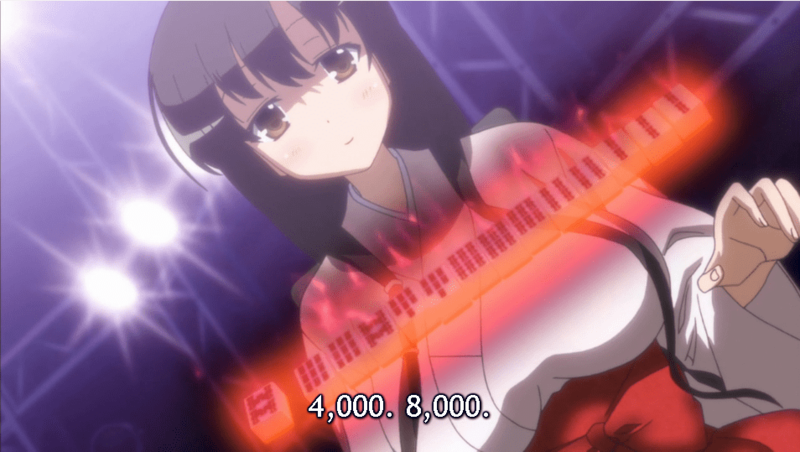 To put it simply, there are four aspects of Saki and its approach to mahjong that I love, and that I love in pretty much every other competition anime I enjoy, so I will look at each one in turn. 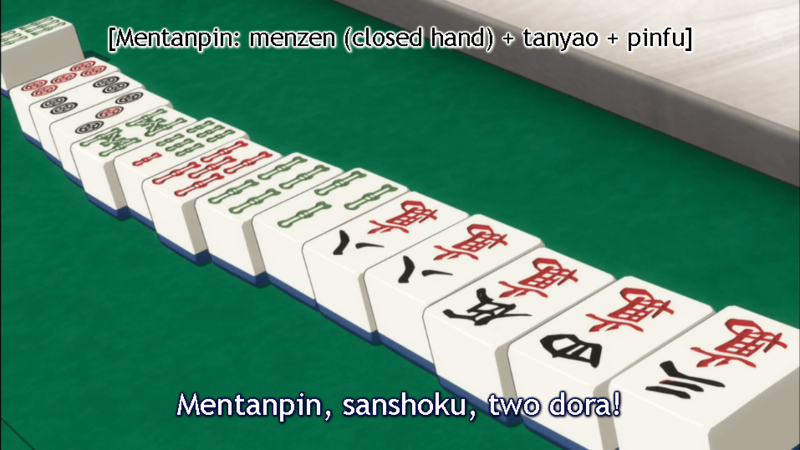 Granted, part of the reason I got interested in learning mahjong is because the show doesn’t explain that much of it and the subs don’t really help that much either. Any good competition anime will spark some interest in the game the characters are competing in. For actual sports anime, even if I have no interest in playing the sport in question, the good ones will always at least inspire interest in the sport itself. Haikyuu is a great example of this, as while volleyball is pretty near the bottom of “sports I want to play at any given time” list, the show does a great job of highlighting the multiple aspects of the game and how each player’s role fits into the game. As such, I find myself more interested in the sport itself, enough to watch some games of actual volleyball during the 2016 Olympics. Notably, the game in question needs not be a real-life game. The real world might not be ready for mock tank battles yet, but Girls und Panzer makes the tank battles plenty interesting to follow, in part because of their faithfulness in adapting the qualities of the actual, real-world tanks themselves. Making a competition anime based on a made-up game is much more difficult overall, as there need to be enough familiar elements to grab the viewer’s attention and make them care about the made-up game in question. In a somewhat more negative example, the Aokana anime earlier this year featured some weird game involving flying about in the sky and either racing around a course or trying to tag an opponent’s back. While I have not seen much of the show, from what I did see I could not really care about the game itself because it was too unusual and confusing. On the flip side, while I am not watching the show, I can understand why something like Keijo has gotten popular; obvious fanservice aspects aside, the base concept of trying to body-check opponents off a platform is familiar and easy enough to understand. The bottom line is, the game should be fun to watch. The players should look like they are having fun playing, too, for the most part. I should mention that, if an anime has significant life-or-death level consequences for losing the game, I do not consider it a competition anime. Last I checked, games were supposed to be fun, and while there is a place for death games, when I want to watch a competition anime I want to enjoy that sense of fun. As I mentioned, Saki features the game of mahjong, which has multiple different approaches of play, and also features players with various supernatural powers that they use to influence the game. This leads well into the next thing I love about the show and competition anime in general: a showcase of a large variety of players and their different abilities. Saki gives plenty of focus to not only the titular protagonist’s team, but also the team members of their competitors. As such, we get to see a variety of playstyles and abilities. Even among those without supernatural abilities, the players range from those who prefer winning quickly and frequently with low-scoring hands, those who would rather build up high-scoring hands, those with a more defensive playstyle, those who like setting up traps for others to play into, or those who play a highly analytical game that, for better or for worse, pretends that none of the aforementioned supernatural abilities exist. Add in those abilities, though, and we have players winning frequently early game, winning off hands with bad waits (few tiles left in play that can complete the hand), winning off the last tile to be drawn (which is worth extra points), purposely stifling other players’ hands, or even summoning deities to possess their bodies and play the game for them. Normally I’d say there are better uses for summoning deities than making one-suit hands in parlor games, but in this world, mahjong is Serious Business. One thing that makes the game of a competitive anime interesting to viewers is the variety of skill sets and playstyles the game has, and good competitive anime will take advantage of that and feature large casts of characters to show off those playstyles. Of course, to do this, most competition anime will have to give focus to opponents and opposing teams as well as the protagonist and his/her team, in order to have more characters to feature a good variety of abilities. This is hardly a bad thing, as thanks to the natural cast-herding based on teams and the attachment of each character to a particular playstyle means that competition anime are often the best at juggling loads of characters. Of course, it is not just the variety of playstyles and abilities that make a competition, but also how they play off each other to create a tense and exciting game. There is an art to creating game stories that are exciting to follow, which is way more complex than I can talk about. However, having a strong cast of characters with different abilities is the backbone of crafting a good game. A player is more than just her abilities and playstyle, though; each player also has a story behind why she got into the game, and where she wants to go with the game. Saki has extensive focus on not just the players’ abilities, but also their personal stories, including their backstories, personalities, and ambitions for the game. The titular character, Saki, for example, originally starts off hating mahjong, as when she played with her family in the past, they would be sore losers if she won, but they would not give her rewards if she lost, leading her to play a twisted playstyle in which she ended every game with a +/- 0 score (noted to be even more difficult than outright winning). Her joining the mahjong club will change that, of course. These stories are not limited to Saki and her team, though. Just like how the show gives plenty of focus on opposing players’ abilities, it also develops some storylines and characterizations for them, sometimes even tying those in to their abilities. 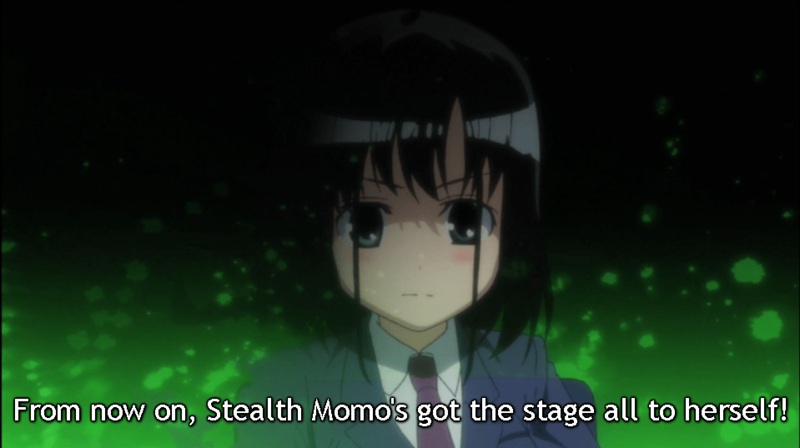 For example, one opposing team character, Momoko, had always had almost no presence, so that most people ignored her; however, when one of the mahjong club members took notice of her playstyle online and scouted her out, she found herself wanting to play to stay connected with the person that actually noticed her—and she plays by taking advantage of her lack of presence at the game table, so that opponents do not notice she is even playing with them until they play into her hand. She might want to consider playing basketball. I hear stealth players are popular there, too. Having solid stories for the main characters is a given, but good competition anime will go above and beyond to give worthy characterization to not just other teammates, but players on opposing teams. This not only makes the protagonist’s team more interesting, but it also makes it easier to sympathize with opposing teams, even if you know that they have no chance at actually winning. This is where the lack of life-or-death scenarios for these games helps out a lot as well; it becomes easier to get attached to opposing teams when you know the worst they have to deal with is the pain of losing. Overall, being able to care about all sides of a competition is important for the best competition anime, as it greatly increases the investment one feels for the show. Finally, competition anime allow for plenty of opportunities to develop strong interactions between characters. If the competition involves multi-person teams, relationships between teammates becomes a major part of the show. Saki makes its mahjong matches team matches, where five players on a team each take a turn at the table. As such, teammate interaction is usually limited within any one particular player’s game, so the show makes up for it by incorporating the relationship development into the character backstories. Granted, Saki being a moe girl show, this takes the form of borderline yuri relationships, which I know not everyone is a fan of, but even then I do appreciate seeing how the girls’ friendships with their teammates support their games. I’m pretty sure it’s perfectly normal for a girl to embrace another girl in the rain when that girl has finally found a strong potential rival/teammate. Even in competition anime where the games are of a one-on-one nature, though, there is one type of character interaction any competition anime has plenty of: interaction between opponents. This comes in many forms, from intense rivalries to friendly spars and even to some serious matters extending past the game. In Saki, the titular character is in part motivated to reach the Nationals to face her older sister, the reigning high school champion, whom she has been estranged from for various reasons. Her closest friend, Nodoka, mainly wants to play for her own teammates, but unbeknownst to her, her old elementary school friends have also joined the high school mahjong tournament to meet her again, and there is an entire side story series dedicated to them and all the schools they meet along the way. On a more direct level, the first season of the anime features one significant opponent in Koromo, whose playstyle of torturing her opponents with bad luck until she wins off the last tile to be drawn has pushed others away from her; the climax of the first season involves not only how Saki and the other players at the table face her gameplay, but also how they might be able to actually reach out to her. Between personal stories and interpersonal ones, competition anime provide lots of characterization opportunities unique to the genre. Add that on to an interest in the game in question, and you have an anime genre that I am always ready for more of. 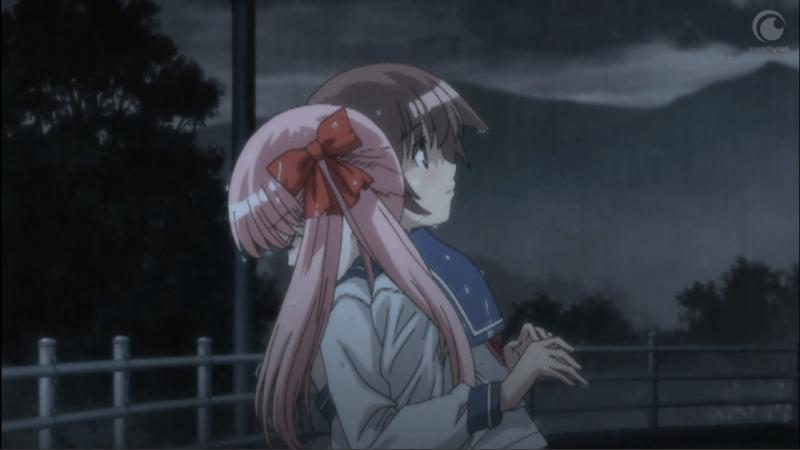 For the most part, this post was an analysis of what makes competition anime so compelling, so I have not touched on what Christians can learn from it like I usually do, until now. For Christians, especially those who actively participate in sports and other competitive games themselves, competition anime like Saki provide all sorts of valuable lessons, including the following based on the four points I mentioned above. Show a love for the game. This ties in to the whole idea of doing whatever you do for the glory of God, which I mentioned earlier in my New Game! coverage. Also, it helps to remember that, while God might not have directly created whatever game or sport you play, He did create the people that would then shape that game or sport, so by all means, showing love for the game is showing love for God’s creation. Be thankful for and make use of your unique abilities. Competition anime make it very clear how each player’s unique abilities are important to them, instead of all players simply trying to imitate one “ideal” player. God made you with a unique set of skills and abilities, and whether you play a game or sport or work in some field, you would do much better to make use of your own unique skills to find your own role than to try to force yourself into a role you are not suited for. Consider how competitive games fit into your own personal and spiritual growth. Paul makes some statements about how the Christian life is like training for a competition (namely, a race), so it definitely makes sense that what happens in a game can impact all parts of your life. Making an idol out of a game’s results is never a good thing, but things like the hard work of training and learning to deal with wins and losses can all be valuable life lessons for our own stories. Consider competitive games as an opportunity to be a witness to teammates and opponents. In particular, participating in competitive games is a great opportunity to form relationships. Having strong relationships with teammates is a given, but we can also reach out to our opponents in this way. The focus of competitive anime on opponents’ stories can help you remember that your opponent has his or her own story for how they got into the game and what they want out of it, so we can respect that. Personally, I do not believe that God grants any divine favor over Christians to win games over non-believers, and that praying for victory is a prayer that will not be answered affirmatively. However, when we pray to God to play to the best of our ability, persevering through difficult situations and keeping sight of victory, that can definitely be a strong witness to Christianity. The first season of Saki and the Nationals sequel can be found here on Crunchyroll, while the Achiga side story can be found here (you should watch it after the first season, though whether you watch it before or after Nationals does not matter too much; it aired before Nationals, though). Be warned that, in addition to the borderline yuri throughout the series, there is also a moderate amount of fanservice. Also, you might want to learn a bit about Japanese mahjong first; this site can help you with that. Are you ready for LIVE ACTION SAKI? It’s either going to be amazing or abysmal, but Saki is really fun, so I’m going to give it a try lol. Yeah, I’ve been seeing stuff about that. Not sure how I feel about the characters being in live-action but as long as the mahjong is still flashy it’s still worth a watch from me. You forgot the mention Saki’s massive all-star cast.